George W Bush; "It’s Islamic Fascism"……. – The Tundra Tabloids……. George W Bush; "It’s Islamic Fascism"……. And I couldn’t agree more. This ideology was thought to have been defeated as a world wide movement, with the defeat of the Nazi Axis powers at the end of WWII. What went overlooked was the surviving embers of that hate filled ideology within the Arab/Muslim states of the Middle East. 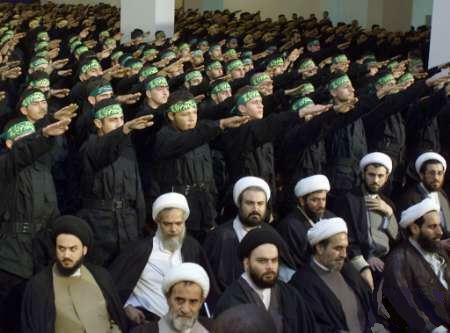 Whether it be the Hezbollah, as in these two picture, or Hamas and al-Qaida, the background message is still the same, A thriving democratic Jewish state, Israel, cannot be allowed to remain a viable state within the Middle East. The Washington Times has an op-ed that discusses the US president’s latest phraseology, which has been envoked a few times since mid 2005 . The US admin. has been veering away from the often stated “War On Terrorism”, to the more correct observation that it’s Islamic/st fascism behind all the terrorsim, and the sooner it’s identified, the sooner the world can be better engaged in the fight against it. “Fascism is a chauvinistic political philosophy that exalts a group over the individual — usually a race or nation, but in this case the adherents of a religion. Fascism also espouses centralized autocratic rule by that group in suppression of others. It usually advocates severe economic and social regimentation and the total or near-total subordination of the individual to the political leadership. This accurately describes the philosophies of Hitler, Mussolini, the leaders of Imperial Japan and other fascistic regimes through history. It also describes Thursday’s terrorists. 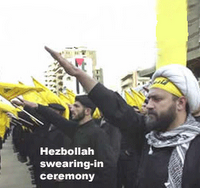 Previous Post Previous Post Hezbollah, The "A-Team" Of Terrorists……. Next Post Next Post Open Letter To Nasrallah, By Egyptian Blogger Sandmonkey…….